We were having a very difficult time deciding where to go on Daniel's Spring Break this year....we looked at everything from hiking in Scottsdale Arizona to exploring Ecuador and the Galapagos. We had a somewhat limited time window due to Daniel's break from school and flying out of Cleveland there are very few "easy" options (more on that later). At one point we asked Daniel what his perfect Spring Break would include and he said SNORKELING! So that settled it...we became focused on finding a place where we could enjoy a ton of great snorkeling in late March...and not just on tours. We wanted a place where we could do some "off the beach" snorkeling as well." All of these places were great, but none of them were a perfect fit for this trip...as the dates fast approached we continued to search. The focus turned to flights...were could we get that was "new and cool" without being a huge undertaking. Again, somewhat of a roadblock...tons of options, but most were either very expensive, logistically difficult, or the destinations were not "out there" enough for us. One thing we did notice: for some reasons flight were fairly inexpensive for this time period to St. Lucia....we had never been there and always wanted to visit...maybe there is something to this? So, we started looking at accommodations - remember, this was very last minute, so not much was left and most of what was left was VERY expensive! Plus, while St. Lucia is an island, it isn't know for its epic snorkeling. So now what? We were starting to get very frustrated and the window of opportunity was starting to close! Then we remembered looking at an area several years prior...St. Vincent, Petit St. Vincent, and Palm Island. Where was that at again? We remembered it looking amazingly beautiful, but difficult to get to. How do you get there? Inter island flights from either Barbados or ST. LUCIA...I think that we're on to something here! So we began to dig in a little deeper on this area, we knew that we could get affordable flights to St. Lucia...so what were our options if we added one more "little" flight from there...because, by now we know that the places that are a little harder to get to are worth it! . "The best places are usually the hardest to get to"
So we started looking at area of St. Vincent and the Grenadines...is that a country? or is each island its own country? We started coming across names of islands we had never even heard of before...which as avid travels always looking for new places...is VERY exciting!! Bequia, Canouan, Union Island, Young Island, Mayreau, Carricou, just to name a few. This was like hitting the travel lottery...and entire island chain if possibilities! Given our quickly closing travel window, we decided to book airline tickets from Cleveland to St. Lucia (via Toronto...more on this later!) to put our stake in the ground! Alright, now we were getting somewhere...we were flying to St. Lucia and then continuing on to somewhere in St. Vincent and the Grenadines. Young Island Resort - which is a small, private island just off the coast of St. Vincent. David's Beach Hotel - a small 10 suite resort located on Union Island. 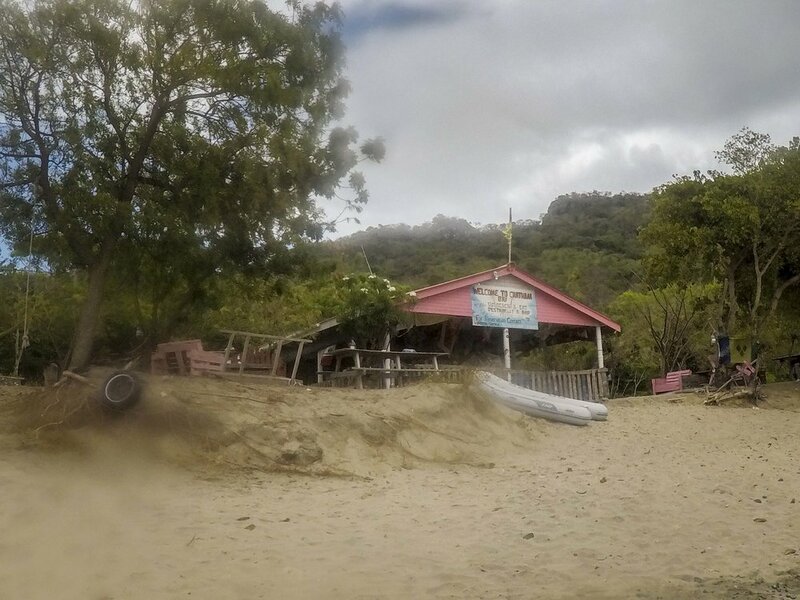 Bequia Beach Hotel - A beachfront resort located on the island of Bequia. 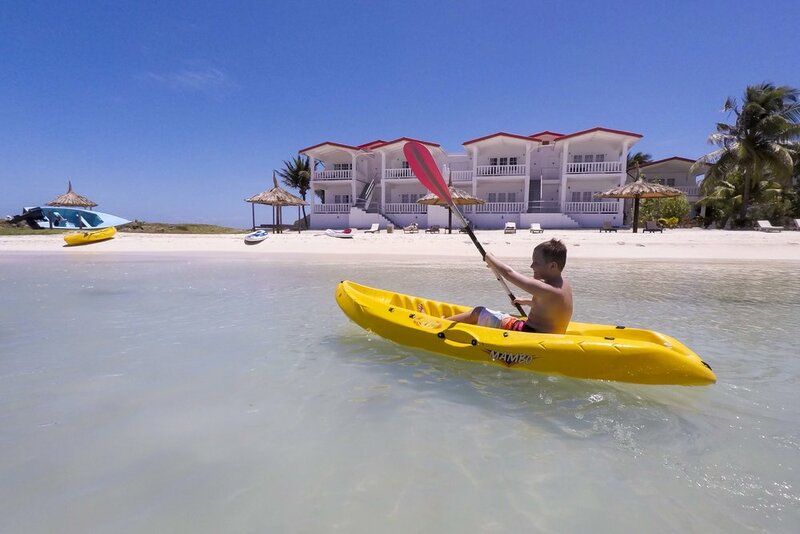 "Its not for the Ritz Carlton crowd...this is the real Caribbean experience"
Where as a lot of people would read this and immediately rule it out...we looked at it and thought - PERFECT! Okay, so know we had flights to St. Lucia and we wanted to stay at David's Beach Hotel on Union Island...how do we get from one to the other? The short answer is a small flight on SVG Airlines from UVF (Hewanorra International Airport) in St. Lucia to a tiny little airport on Union island. The full answer includes us realizing that the ONLY day that this (once a day) flight between UVF airport on St. Lucia (**note their are two airports on St. Lucia) and Union island is WEDNESDAY....which also happened to be the day we were flying in (because the international flights were the cheapest!) So after some coordinating with the staff at David's Beach and SVG Airlines we had a plan: Fly from CLE to St. Lucia - spend one night there - then take the inter-island flight to Union Island the following day - spend 5 nights at David's Beach Hotel - then fly back to St. Lucia and spend 2 nights there before heading home! Pheew! Finally we had our Spring Break trip booked...to a place on an island we had never even heard of several weeks prior and there was going to be a bunch of great opportunities to snorkel...awesome!! You can not book the SVG flights online so contact SVG Airlines directly or ask your hotel to assist you. The schedules and flight paths of these flights are not "set in stone" - so times may vary and you may make quick stops at other islands along the way. On the way to Union we stopped at Mustique and on the return we stopped at Canouan and Bequia. Another option is flying via Barbados. There are daily flights to St. Vincent and the Grenadines as well. Union island is only about 3 square miles (3 miles long and 1 mile wide) with a population of roughly 3000 people. So as you can image the accommodations choices are very limited...no chain hotels, mega resorts, or high rises...perfect for what we were looking for! After or initial research we immediately zeroed in on David's Beach Hotel. It looked like the perfect spot for us: low key, only 10 rooms, snorkeling available right off the beach, and the use of kayaks, snorkel equipment, paddle boards, etc. The term "all inclusive" is sometimes used in the description to describe David's. It is....and it isn't! Let's clarify, it is an all inclusive in the fact that all of your food and drinks, etc. are included...but the menu is somewhat fixed. At breakfast you have your choice of a variety of items, where as lunch, and dinner are a fixed menu. So if you have any specific dietary restrictions or a picky eater (as we do!) be sure to coordinate with the staff ahead of your stay. At first we weren't sure what to think of this pre-fixed style menu...but this is mainly because we thinking about protein levels, carb counts, etc....not just going with the flow and enjoying it. As our stay went on we started to settle in and really enjoy, not having to seek out a restaurant, or even decide what to order...and the amazing, included nightly desserts were a real easy to get used too! I mean, come on...we wouldn't want to offend the staff right? One night Todd, "had a moment" with an outstanding piece of carrot cake...declaring that this would be the benchmark by which all others were measured by going forward! The good news is that we were so active during our stay at David's, we could enjoy the nightly desserts without too much guilt! Speaking of activities, the location of David's is amazing! Regardless of what the winds and water give you, there is somewhere you can enjoy yourself! The first two mornings we saw multiple spotted eagle rays feeding in the shallow waters right off shore as the tide receded! The rooms are all beachfront, we enjoyed having two interconnected second floor beach suites. The views from the balconies were amazing! (see below) A great place to enjoy the sunrise AND sunsets given David's orientation. We took full use of all of the water based activities at David's...we enjoyed countless hours snorkeling right off the beach, kayaking, and all 3 of us tried stand up paddle boarding for the first time. Daniel was a natural...picking it up immediately! Panoramic view from our balcony...with a rainbow! So how was the snorkeling?? 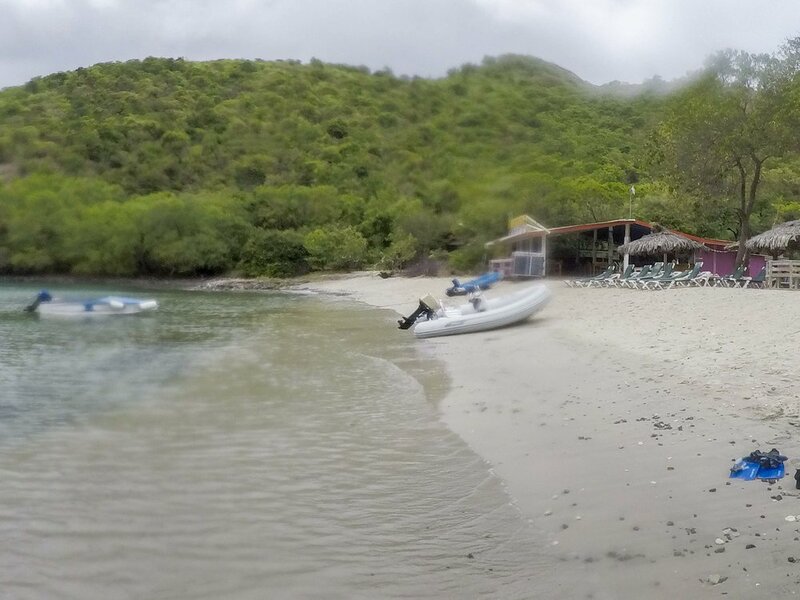 Check out this quick snorkeling recap video from Union Island (both at David's and Chatham Bay), Mayreau, and Tobago Cays. While researching St. Vincent and the Grenadines, one place came up over and over again...Tobago Cays. Described as the paradisiacal location where you can swim with the sea turtles, it quickly rose to the top of our "to do" list while on Union Island. We booked the Yannis Full Day Sailing Trip through the Palm Island Resort, which included visits to both Mayreau and Tobago Cays. We (along with several others) were picked up by a large, well equipped, catamaran named "Tornado" at the Union Island marina. Then we motored the few minutes across the way to nearby Palm Island. They beached Tornado right on the beautiful beach of Palm Island and we had a few minutes to explore and look around before we greeted the rest of our group...probably about 20 in all, which seemed perfect for the size of the boat. We were quickly on our way and the sails were up and we were headed to the neighboring island of Mayreau, which is roughly only 1.5 square miles with a population of around only 300 people centered in an unnamed village. We anchored near a beautiful little beach, and we given time to snorkel and explore....of course we spend all but about 5 minutes snorkeling!! Enjoying the great diversity of fish along the rocky ledge of this small island as it descended into deeper water. We were super impressed with the snorkeling off of Mayreau...and we weren't even to the best part....the sea turtles at Tobago Cays! One side note about Tobago Cays...we were a little bit nervous leading up to the trip, because it was always phrased as "snorkel with the sea turtles," - not "you might see," or "most times," etc. It was like they WILL BE there...which made us a bit uneasy, hoping the turtles weren't in any sort of captivity, netting, etc. In the back of our minds we could here Anthony Bourdain saying "bring in the stunt turtles!" Turns out Tobago Cays is just a really cool place and the turtles love it there...and if not they are free to leave! We weren't even set on our mooring ball and one of the crew members had already spotted a turtle. We, along with several others, quickly grabbed our provided snorkeling gear and jumped in the water swimming towards the spotted turtle. We quickly realized that we didn't need to crowd around this one turtle, because they were everywhere! All different sizes and shapes...swimming, feeding on the abundant grasses on the ocean floor. It truly was an amazing experience to be able to calmly view so many of these amazing creatures...doing what ever they wanted. We took a quick break from the turtles and the occasional sting rays to just enjoy the little piece of sand rising out of the water. Scattered with a couple of dinghies from the large number of beautiful sailboats anchored and moored in this little piece of paradise! Again we were one of the last ones on the boat at the designated time. Then we were treated to a wonderful buffet lunch in this amazing location...various salads and fruits paired with locally prepared fish and chicken definitely hit the spot after all of the time in the water. The staff on Tornado were amazing....you really didn't want for anything...all food, drinks, and gear were included. On the way back we stopped at very nearby island, to stretch our legs, explore, and the crew shared some of our lunch leftovers with the stingrays, puffer fish, etc. We thoroughly enjoy our trip on the Yannis Sailing trip, the sites were amazing and it was great to get out and explore some of the islands in this area by sea. On our last day at on Union island, David arranged for us to take a trip around the island to nearby Chatham Bay. It was an overcast day and the weather seemed a little "iffy," but really enjoyed the 15-20 minutes boat ride to Chatham Bay. As we rounded the point, we noticed quite a few sailboats anchored and moored inside the bay, as well as a couple huge yachts. As we approached the beach we arranged to be picked up two hours later, as we were mainly interested in snorkeling. Along the beach there are number of different open air restaurants, etc. for travelers and day trippers. We were unsure of the weather...so we had only packed what fit in our dry bag. The trip was sort of last minute, so we had very little knowledge of the area and where to snorkel, etc. As we walked into the water we identified an area along a rocky edge that we thought would be a good starting point. There had been quite a bit of rain overnight and early that morning so the water was a little cloudy but the amount of underwater life was impressive! We were treated to a wide variety of fish, including parrot fish, trumpet fish, angel fish, and even a couple of eel towards the end. The snorkeling was so good, we spent all but 10-15 minutes of stay in the water!! We even saw a starfish as we were heading towards the beach on our final pass. We were really impressed with amount of fish we saw in Chatham Bay, especially since we had no previous knowledge of the best areas to snorkel. Next time we will allow more time! !